MINNEAPOLIS -- Hall of Fame broadcaster and ASA member Herb Carneal, whose fluid and smooth baritone narrated Minnesota Twins games for the past 45 seasons, died April 1 of congestive heart failure, the club said. He was 83. Carneal was part of the club's radio play-by-play crew for all but the first year of the team's existence in Minnesota. "To hear that voice was magic," said former first baseman Kent Hrbek, who listened to Twins games growing up in the suburb of Bloomington and later played 13 seasons for the team before retiring in 1994. "When I was a kid, it meant school was almost out and spring was coming." A native of Richmond, Va., whose first radio job was right out of high school, Carneal called Athletics and Phillies games in Philadelphia and Orioles games in Baltimore before coming to Minnesota in 1962 -- a year after the Washington Senators moved west to become the Twins. 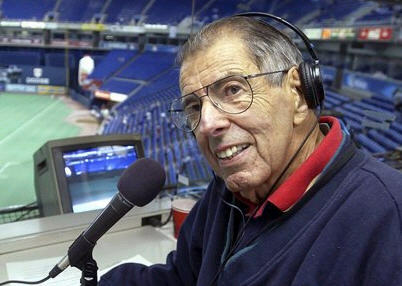 Carneal was given the Ford C. Frick Award for major contributions to baseball broadcasting by the Hall of Fame in 1996. With his understated style and southern drawl, Carneal's warm voice became synonymous with broadcasts on WCCO-AM and affiliates on the network throughout the Upper Midwest. Opening each game with his signature greeting, "Hi, everybody," Carneal was a master of minutiae who could easily recall old facts and statistics well into his 80s. His on-air partner for the past 20 years, John Gordon spoke with Carneal each week this spring. Even though his health was failing, Carneal consistently impressed his colleague by the way he stayed on top of the news from Minnesota's camp -- and around the majors. That professionalism and attention to detail was one of his strengths. Even when his time on the air was limited recently, Carneal's preparation remained meticulous. "I used to just be amazed," Gordon said Sunday. "'Come on, Herb, you're only doing three innings. You don't have to put all of this together like you're auditioning for a job.' But that was him." On recent visits to the Metrodome, Hrbek was struck by how frail Carneal had become. "But stick him in front of that microphone, and it was smooth as glass. You'd think you were 10 years old again, listening to him," Hrbek said Sunday. Survived by his daughter, Terri, and grandson, Matthew, Carneal was preceded in death by his wife Kathy. Funeral arrangements were pending Sunday. Carneal stopped traveling in 1998, scaled back further in 2003 and last year was limited to the first three innings of weekend and weekday afternoon home games. He was scheduled for similar spot duty on the air this season, but his deteriorating health had put that duty in doubt. Needing a walker to get around and his vocal chords clearly weakened, Carneal sat in the media dining room and smiled before last year's home opener -- still eager to call the game. "As long as I can do the job the way it should be done," he said then. In a 2003 interview with The Associated Press, Carneal spoke warmly about the way he was able to connect listeners throughout the region to the team -- whether they were sitting on their porches, driving in their cars or cooking dinner in the kitchen. "Sometimes I say, 'What's an old man like me doing here announcing a kid's game?" he said then. "But I'll get a letter from someone saying how much they look forward to hearing the games on the air. That's one of the things that makes me keep going." His favorite call came in 1987, when the Twins won their first World Series. Sixteen years later, in that interview, he mimicked his original narration -- without hesitation -- of the final play of a Game 7 win over the St. Louis Cardinals. "Willie McGee hits a little bouncer down to Gaetti, there's the throw to Hrbek ... and the Twins are world champions! The Twins are world champions!" Carneal dabbled in football, but after announcing some Triple-A games in Springfield, Mass., and then several seasons of major league broadcasts he knew his sport was baseball, a youth-instilled passion. "Most of the kids that I hung around with, we all liked baseball," Carneal said. "We just liked to play. It was something we all seemed to enjoy." "Just give me two pillows and a bottle of beer. And the Twins game on radio next to my ear. Some hark to the sound of the loon or the teal. But I love the voice of Herb Carneal."